IPC and the Wire Harness Manufacturers Association (WHMA) teamed to develop this significant update, adding lead free acceptance criteria, a new chapter devoted to electrical and mechanical testing, and enhanced criteria for molding and splicing. This Revision has 599 full-color pictures and illustrations - nearly 100 new. Readability and usability were improved based on user feedback from the original release. 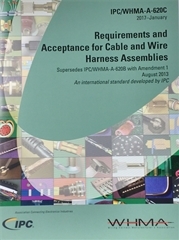 Included in the 19 chapters are criteria for wire prep, soldering to terminals, crimping of stamped and formed contacts and machined contacts, insulation displacement connectors, ultrasonic welding, splicing, connectors, molding, marking, coax/twinax cables, wrapping/lacing, shielding, assembly and wire-wrap terminations.